In the days of the Vikings, each hut was made out of sod and life was extremely simple compared to the way of life which we all know today. At the L'Anse aux Meadows National Historic Site in Newfoundland, Canada, you can journey through the reconstructed huts and see how the Vikings had indoor fire pits where they cooked their meals. 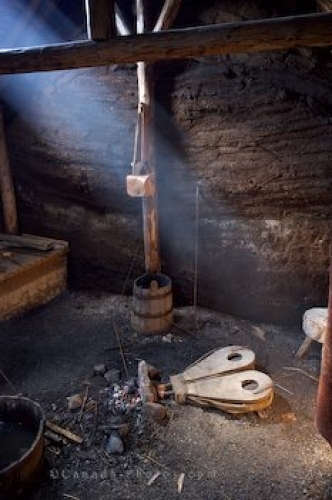 Interior of the reconstructed Smithy Sod Hut at L'Anse aux Meadows National Historic Site of Canada and UNESCO World Heritage Site, Northern Peninsula, Great Northern Peninsula, Viking Trail, Trails to the Vikings, Newfoundland, Newfoundland Labrador, Canada. Sod Hut at L'Anse Aux Meadows, Newfoundland.